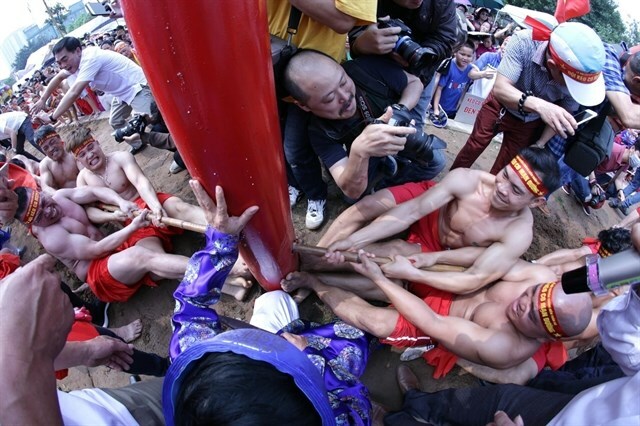 Hanoi (VNS/VNA) - An ancient form of tug of war is still organised at the Tran Vu Temple Festival on the third day of the third lunar month in Thach Ban ward, Long Bien district, Hanoi. Legend has it that during a serious drought, only one of 12 wells in Ngọc Tri village still contained water. Men from Cho hamlet went to collect water from the well but were stopped by men from Dia hamlet. At that time they used bamboo twine to carry the water home.